A concert residency (also known as musical residency or simply residency) is a series of concerts, similar to a concert tour, but only performed at one location. An artist who performs on a concert residency is called a resident performer. Concert residencies have been the staple of the Las Vegas Strip for decades, pioneered by singer-pianist Liberace in the 1940s and Frank Sinatra with the Rat Pack in the 1950s. According to Billboard, Celine Dion's A New Day... is the most successful concert residency of all time, grossing over US$385 million ($465.20 million in 2018 dollars) and drawing nearly three million people to 717 shows. This commercial success was credited for revitalizing Las Vegas residencies, which was always known as a place where singers go when their careers are in decline. According to The Guardian, the concept of a concert residency was established by pianist and singer Liberace with 1944 debut in Las Vegas. Nearly ten years later, Liberace had his own show at the Riviera Hotel and Casino in Las Vegas, which reportedly earned "Mr. Showtime" around $50,000 per week. After years of pursuing other projects in Los Angeles, he returned to Vegas residency and earned around $300,000 a week until he died of AIDS in 1987. CeeLo Green held his 2013 residency, CeeLo Green Presents Loberace, as a tribute to Liberace. 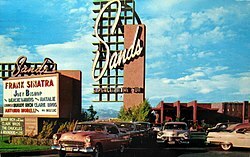 The Sands Hotel and Casino (1959), where Frank Sinatra was its headlining resident performer. Liberace's 1944 debut was followed by Frank Sinatra with the Rat Pack, and Elvis Presley. In April 1956, Presley began a two-week concert residency at the New Frontier Hotel and Casino, Las Vegas, following the release of his self-titled debut album. His shows were poorly received by the conservative, middle-aged hotel guests—"like a jug of corn liquor at a champagne party," wrote a critic for Newsweek. From 1969 to 1976, Presley performed 837 consecutive sold out shows at the Hilton Las Vegas, which has since been renamed the Westgate Las Vegas Resort & Casino. Kurt Melien, vice president of entertainment at Caesars Palace, explained that "Historically, Vegas residencies were more a loss leader event – famous artists playing in small showrooms just to draw in the gambling crowds." In the live music world, Las Vegas used to be known as the place where singers went to die, where they could earn a crust in their twilight years entertaining tourists on the Strip alongside magicians like David Copperfield or Siegfried & Roy. Celine Dion revitalized residencies in the 21st century, with the success of her A New Day... residency (2003–2007). Her residency introduced a new form of theatrical entertainment, a fusion of song, performance art, innovative stage craft, and state-of-the-art technology. She managed to popularize the Las Vegas residency as a desirable way for top artists to essentially tour in place, letting their fans come to them. Kurth Meline explained, "Celine was a pioneer without question. Twenty years ago, we couldn't have got someone the stature of Britney Spears to appear in Vegas. Stars like her would never have considered it if Celine hadn't paved the way. She changed the face of modern Vegas." Dion returned to Las Vegas on March 15, 2011 with her second residency, Celine, and performed her record-breaking 1000th overall Las Vegas residency on October 8, 2016. Many other major performers have followed and accepted residency offers. Las Vegas has become the center of concert residencies for decades. New York City has also grown as a destination residency, beginning with Billy Joel at the Madison Square Garden in 2014. American rock band Phish also performed 13-shows residency at the same venue, from July 21 to August 6, 2017. Bruce Springsteen held his 2017–18 residency, Springsteen on Broadway, at the Walter Kerr Theatre in New York City. In August and September 2007, O2 Arena in London held 21 Prince shows. From January to March 2009, Luis Miguel played a run of 25 shows at Auditorio Nacional in Mexico City. Michael Jackson had scheduled 50 concerts in 2009 at The O2 Arena in London, but they were cancelled due to his death. One of the most successful residency in history is held by Elvis Presley, who performed 636 consecutive shows at the International and Las Vegas Hilton from July 1969 through December 1976. However, the boxscore data for his residency is unavailable. According to Billboard, Celine Dion's A New Day... is the most successful concert residency of all time, grossing over US$385 million ($465.20 million in 2018 dollars) and drawing nearly three million people to 717 shows. Celine Dion leads as the highest-grossing solo artist of all time in residencies (A New Day and Celine). Her second residency, Celine, is also the second most successful one. It grossed a reported $233,730,933 between 2011 and 2019. Following Celine Dion, Elton John has become the second most successful concert resident performer, whose The Red Piano residency grossed a reported $169 million between 2004 and 2009. Another top-selling residency was Britney Spears's Britney: Piece of Me, which began in December 2013 and ended on December 31, 2017, grossing over U$137 million. Outside of Las Vegas, Bruce Springsteen grossed over $113 million with 236 shows of his New York residency Springsteen on Broadway. ^ a b c McIntyre, Hugh (September 14, 2017). "Forget Vegas, New York City Has Become The New Go-To City For Concert Residencies". Forbes. Retrieved November 20, 2017. ^ Reuters Staff (November 17, 2016). "Newly engaged Ricky Martin off to Vegas for concert residency". Reuters. Retrieved November 20, 2017. ^ Olya, Gabrielle (April 11, 2017). "Britney Spears, Beyoncé and More Singers Who Have Slimmed Down and Shaped Up for Concert Residencies and Tours". People. Retrieved November 20, 2017. ^ "Paul McCartney 'fancies' O2 concert residency". BBC. December 21, 2009. Retrieved November 20, 2017. ^ THR Staff (August 7, 2012). "Tim McGraw and Faith Hill to Launch Las Vegas Concert Residency". The Hollywood Reporter. Retrieved November 20, 2017. ^ Ganz, Jami (March 14, 2017). "Las Vegas residencies: Here's your guide to summer 2017". Entertainment Weekly. Retrieved November 20, 2017. ^ "Best Resident Performer: Shania Twain". lasvegasweekly.com. Retrieved May 12, 2018. ^ "Britney Spears Rakes in Honors at Best of Las Vegas 2017 Awards". billboard.com. Retrieved May 12, 2018. ^ a b Cragg, Michael (January 19, 2016). "Jennifer Lopez and the changing face of Las Vegas". Retrieved December 4, 2017 – via www.theguardian.com. ^ "Notable Las Vegas performance residencies". sfgate.com. Retrieved December 4, 2017. ^ "Cee Lo Green Takes His Voice to Vegas With Loberace Residency". eonline.com. Retrieved December 4, 2017. ^ "CeeLo Green Talks Las Vegas Residency, 'Girl Power' Solo Album". billboard.com. Retrieved December 4, 2017. ^ Gilliland, John (1969). "The All American Boy: Enter Elvis and the rock-a-billies" (audio). Pop Chronicles. University of North Texas Libraries. ^ Guralnick, Peter. "How Did Elvis Get Turned into a Racist?" The New York Times. January 8, 2004 [Retrieved August 11, 2007]. ^ a b c Bell, Chris (November 29, 2013). "Why is Las Vegas gambling $15 million on Britney Spears?". Retrieved December 4, 2017 – via www.telegraph.co.uk. ^ "Jennifer Lopez heading to Las Vegas for residency in 2016". chicagotribune.com. Retrieved 2016-01-12. ^ Chandler, Adam. "The United States of Billy Joel". theatlantic.com. Retrieved December 4, 2017. ^ "Prince Kicks Off 21-Concert Residency With Epic Three-Hour Show". rollingstone.com. Retrieved December 4, 2017. ^ Katsilometes, John (April 26, 2015). "Was number of Elvis' consecutive sold-out shows in Las Vegas 636 or 837? - Las Vegas Sun Newspaper". lasvegassun.com. ^ a b Inc, Nielsen Business Media (October 18, 2008). "Billboard". Nielsen Business Media, Inc. – via Google Books. ^ a b Devlin, Mike. "Sir Elton rockets back to Victoria". timescolonist.com. Retrieved December 4, 2017. ^ Katie Kindelan (September 17, 2013). "Britney Spears Announces Las Vegas Show Live on 'GMA'". ABC News. Retrieved November 16, 2013. ^ a b "Britney Spears Piece of Me show top $100 million in ticket sales". Billboard. Retrieved 2017-02-03. ^ Paulson, Michael (January 2, 2019). "'Hamilton' Leads a Record-Breaking Holiday Week on Broadway" – via NYTimes.com. ^ a b "SPRINGSTEEN ON BROADWAY Broadway Grosses - 2018". www.broadwayworld.com. Retrieved May 12, 2018. ^ a b c "Top 10 Highest Grossing Las Vegas Residencies Of All Time: Celine Dion, Britney Spears, Elton John and More". Billboard. Wikimedia Commons has media related to Concert residencies.